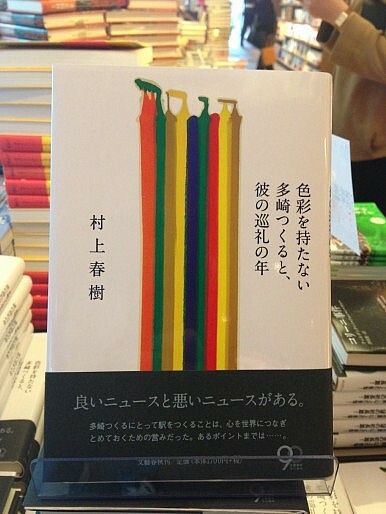 Japanese fans of literary superstar Haruki Murakami have been satiated today with his new novel. At midnight this morning more than 100 fans were queuing at Tsutaya Books in Tokyo’s über-trendy Daikanyama neighborhood to get their hands on the new fictional offering from literary superstar Haruki Murakami. His latest tome, which at 370 pages is relatively short by Murakami standards, is titled Shikisaiwo Motanai Tazaki Tsukuruto Kareno Junreino Toshi (Colourless Tsukuru Tazaki and His Years of Pilgrimage). In preparation for the fit of purchasing likely to ensue across Japan, publisher Bungeishunju went forward with 500,000 copies for the book’s pre-release print run, the largest ever initial printing for the publisher. Meanwhile, Internet pre-sale orders also hit record highs, with Amazon reporting over 20,000 pre-order sales as of last Saturday. That rate was even faster than the third book in Murakami’s most recent release, the three-part novel 1Q84 (which can be read as “1984” in Japanese), which was also a hit overseas. The frenzy is understandable. Fans have waited three years for the new tale from the lauded author whose works have been translated into 36 languages and sold 10 million copies in Japan alone. At Daikanyama’s Tsutaya Books the first day’s sales seem to validate the expectations surrounding the novel. Another shop employee held up a thick stack of paper slips, each one pulled from a sold copy of the novel. “These were from early this morning alone,” he added. While the numbers were not officially confirmed, as of 2:00 pm today the sales assistant ventured a rough guess that the store had sold an estimated 450 copies of the book (with a break for the shop to close between 2:00 am and 7:00 am). Aside from building anticipation by releasing these numbers, the publisher and author remained tight lipped about the shape of the story leading up to the release. While it’s too early for much commentary to have come out yet, that hasn’t stopped speculation. Japanese literary critic Yoshinori Shimizu noted the existence of an anagram in the name “Tazaki Tsukuru,” which can be reorganized when written in the Japanese phonetic alphabet to spell out “Tsuzuku Chikara,” or “continuing strength.” “It is extremely interesting as it seemingly alludes to something to do with the time after the major quake disaster,” Shimizu told the Sankei Shimbun. Others have wondered about the title being an echo of Years of Pilgrimage, a piano series by Hungarian composer Franz Liszt. What does it all mean? Pundits will surely unravel the work for Japan in the coming days. But for diehard fans who will read the book in other languages, the agonizing wait continues.